These are the brackets and hardware needed to install EVO 10, 4-piston Brembo calipers and the matching EVO 10 rotors on your 2g DSM. Before describing this bracket and hardware kit, we feel we should give a brief explanation of this brake upgrade. 1) Using this bracket and hardware kit on the stock 2g knuckles to locate the Brembo caliper such that EVO 10 rotors and calipers can be installed and used. It should be noted that this method requires removing some material from the caliper where it would interfere with the caliper mounting ears on the knuckle. 2) Replacing the stock 2g knuckles with special JDM knuckles that have caliper mounting ears that match the EVO 10 Brembo calipers. The EVO 10 rotors and calipers can then be installed directly to the knuckles without any brackets or hardware or modifying the calipers in any way. The brackets and hardware kit is used for method (1) above. To use method (2) above, you'll need to get your hands on the special JDM knuckles. Installing this kit using the brackets and hardware method is a bit unusual compared to similar brake upgrades in that in order for the calipers to clear the knuckle and bracket a small amount of material must be removed from the caliper. The area where the material is removed is not a critical structural area, but there's no denying that removing material will (at least in theory) weaken the structure of the caliper. It is mainly for this reason that many people prefer to change their knuckles to the special JDM knuckles that require no modification of the calipers at all. 1) The more or less traditional method where the RTM bracket is bolted to the steering knuckle (with bolts passing thru the steering knuckle into threaded holes in the bracket). As discussed earlier, some material will need to be removed from the caliper in order to clear the knuckle/bracket. 2) Tapping (also known as threading) one of the caliper mounting holes in the knuckle (with an M14x2 tap) and bolting one of the ends of the RTM bracket to the knuckle with an M14 bolt. This method requires less material to be removed from the caliper than method (1) above. Each of the methods above offer certain advantages over the other and there is no obviously superior method. The main advantage of method (1) is ease and simplicity. It requires no tapping of the knuckle, the brackets are simply bolted to the knuckle with supplied hardware. The main disadvantage is that more material must be removed from the caliper to accommodate one of the bolt heads. The main advantage of method (2) is that less material needs to be removed from the caliper since one of the bolts attaching the bracket to the knuckle is threaded in from the backside and thus its head does not protrude into the caliper. The main disadvantage is the extra time and effort of tapping the knuckle. 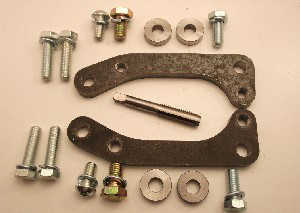 The basic kit includes brackets, spacers, bolts and washers. The quantity and size of the bolts differ slightly depending on the style of kit chosen. Also, depending on the style of kit chosen, a selection of taps is available to enable you to tap your knuckle. NOTE: Photo is for display purposes and depicts hardware for both styles of kit plus an optional tap. Be assured, however, that your order will correspond to your selections in the drop-downs. In addition, it depicts each bracket with two threaded holes. This is the style of bracket used when not tapping your knuckle. If the tapped knuckle method was used, one of the threaded holes in each bracket would be drilled out as clearance for a M14 bolt (which would thread into the tapped knuckle). NOTE: We should point out that these caliper mounting brackets are very strong units: they're made from 1/2" thick STEEL (NOT aluminium) and are extremely strong. The bolts used are 12mm and grade 10.9. These are NOT weak, flimsy components, they are strong and robust. In fact, we'd wager that under the most extreme braking conditions, the "spokes" on your aluminium rims would shear away from the outer portion of the rim, or perhaps the caliper itself would disintegrate long before these brackets failed! Application: DSM (95-99) all models.